Pin satisfaction of your power demands to the weather, and expect the results to vary just like the .. ahem .. weather. One of the paradoxes of energy generation is that the most reliable sources are the cheapest, by far. 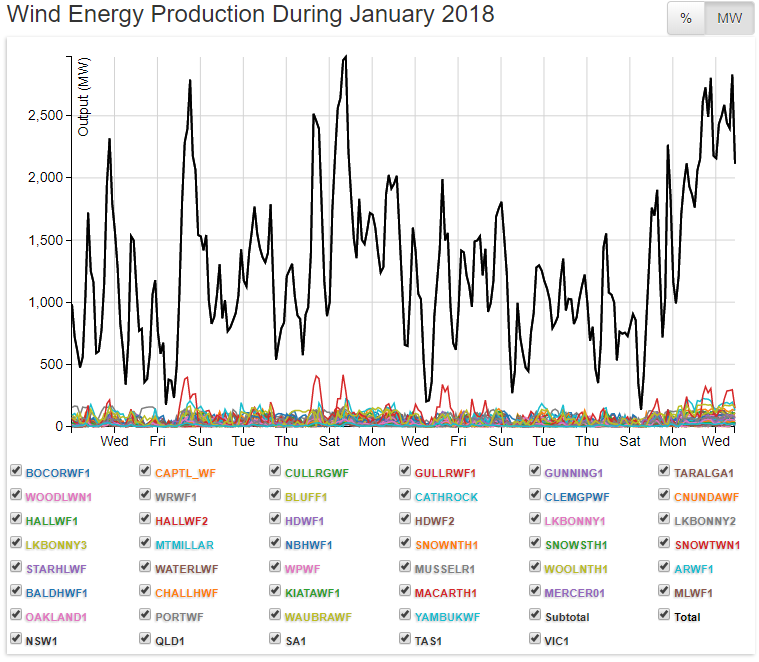 What’s depicted above is taken from Aneroid Energy and shows the entire output of every wind turbine located in Queensland, New South Wales, Victoria, Tasmania and South Australia connected to the Eastern Grid, with a combined notional capacity of 4,675 MW during January this year. Up and down like a proverbial yo-yo, by no stretch of the imagination can wind power ever be described as a ‘system’: it’s chaos. January in Australia means hot weather, and hot weather means calm weather. As temperatures rise, so does the demand for electricity used to cool homes, businesses and hospitals. During one brief hot spell last Summer, the grid manager forced a power cut on hospitals and businesses (euphemistically referred to as ‘demand management’), when wind power output inevitably collapsed. 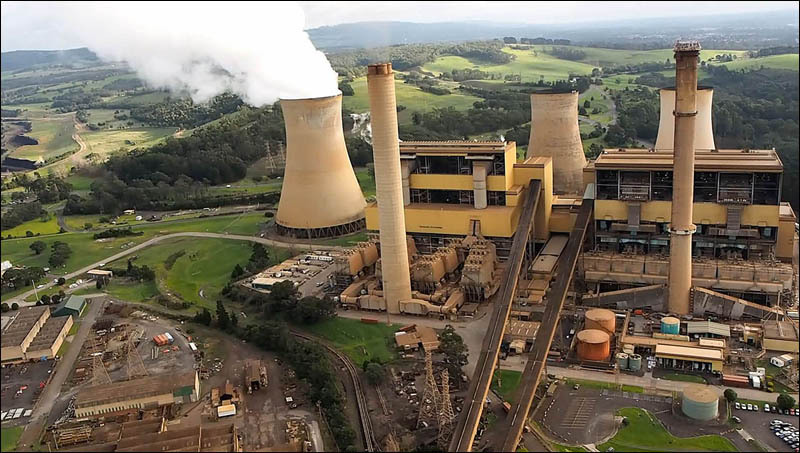 The first article below details just how cheap coal-fired power is in Australia; the second shows how Americans depend upon coal and nuclear power to prevent them freezing to death in winter. The gold-plated stars of our national grid are the old coal plants we’ve built and paid off. 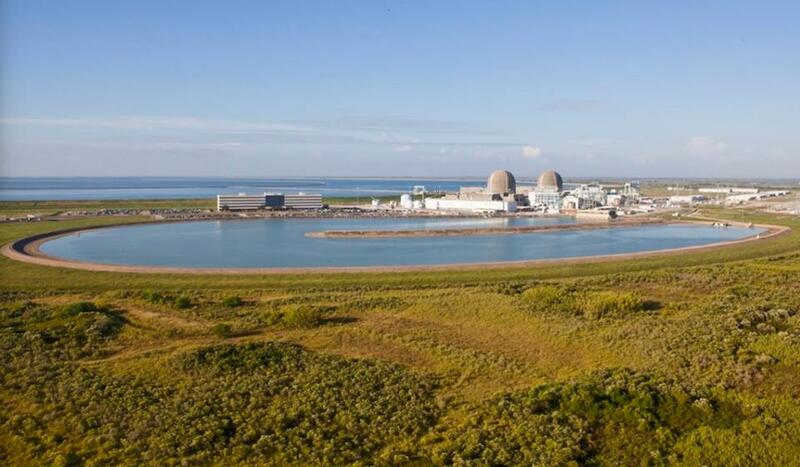 A US report shows how fantastically cheap and bountiful old coal and nuclear plants are. The LCOE or the Levelized Cost of Electricity includes the costs of the concrete, turbines, car parks and coal, plus the maintenance and salaries. It reveals that thirty year old, and even fifty year old coal plants, are the gift from past generations — enormous infrastructure, built and paid for, and ready to churn out bargain electrons. Or in crazy-land, ready to be blown up. Both sides of politics are choosing to destroy the family jewels in the hope of controlling global weather. Most existing coal, natural gas, nuclear, and hydroelectric generation resources could continue producing electricity for decades at a far lower cost than could any potential new generation resources. In the US, these plants keep working as they age. The cheap old brown coal plants in Victoria were running at 90% capacity year in, year out. Though here, the capacity factor partly reflects pagan energy policies. 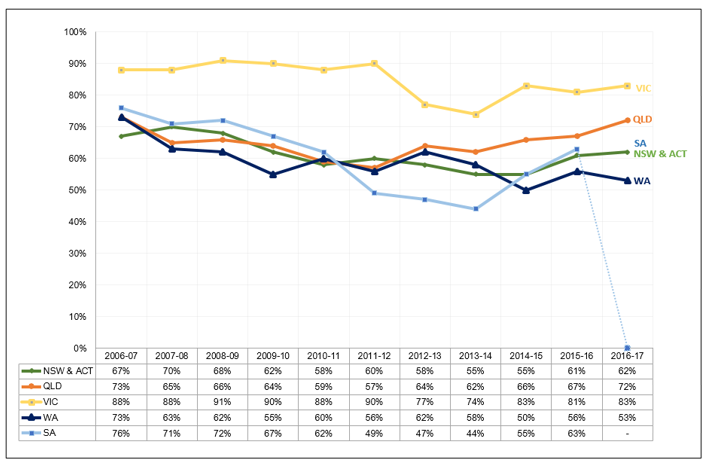 The carbon tax dinted the capacity factor of brown coal in 2012-2014. The RET takes a growing bite. In the US coal competes with nuclear plants and cheap shale gas. In Australia, nothing bar anything, competes with Victorian brown coal (at least in a free market) which is why it is run virtually flat out all the time. Hazelwood is a national treasure. Our findings show the sharp contrast between the high cost of electricity from new generation resources and the average low cost from the existing fleet. Existing coal-fired power plants, for example, generate reliable electricity at an LCOE-E of $38.4 per megawatt-hour on average. Compare that to the LCOE of a new coal plant, which ranges from $80.0 to $97.7 per megawatt-hour depending on how frequently the plant operates. The analysis shows the same for existing natural gas, nuclear, and hydroelectric resources—each produces electricity at a substantially lower levelized cost than its forward-looking LCOE (as estimated by EIA) would indicate. We also find that intermittent resources increase the LCOE for conventional resources through a similar mechanism, that is, by reducing their run time without reducing their fixed costs. We refer to these as “imposed costs,” and we estimate them to be as high as $29.94 per megawatt-hour of intermittent generation when we model combined cycle natural gas energy displaced by wind. Most existing coal, natural gas, nuclear, and hydroelectric generation resources could continue producing electricity for decades at a far lower cost than could any potential new generation resources. At a coal-fired power plant, for example, when a component wears out, only the component must be replaced, not the entire plant. The same is true for nuclear plants, until they reach their regulatory end of life, which is currently defined to be 60 years but could be extended to 80.9 Under current laws, rules, and regulations, large amounts of generating capacity is slated to retire and will be replaced with new generating capacity which will produce electricity at a far higher average levelized cost. The Institute for Energy Research recently identified more than 110 GW of coal and nuclear generation capacity set to close as a direct result of federal regulations. When electricity from an existing electric generating plant costs less to produce than the electricity from the new plant technology expected to be constructed to replace it—and yet we retire and replace the existing plant despite the higher costs—ratepayers must expect the cost of future electricity to rise faster than it would have if we had instead kept existing power plants in service. An unprecedented amount of generating capacity is set to close due to ongoing renewables policies, undervalued capacity markets, currently low natural gas prices, and additional environmental regulations. In the absence of even some of these factors, most existing power plants would remain operational, helping keep electricity costs low for many years or decades into the future. Spot the lie by omission: studies that compare the cost of new coal plants to wind and solar. Stacy, T. Taylor, G. (2015) The Levelized Cost of Electricity from Existing Generation Sources, Institute for Energy Research (IER), based on EIA figures in the USA. Coal plants have been prematurely retired en mass since 2012, due to a combination of federal and state policies and low-priced natural gas. Republicans and the coal industry blamed Environmental Protection Agency regulations for contributing to coal plant closures, which President Donald Trump seized upon during the 2016 campaign. The idea that there’s some fixed mathematical relationship between the amount of wind power capacity needed to replace a MW of dispatchable coal, gas or nuclear power is nonsense. We opened the post with reference to the fact that hot weather, means calm weather, which means no wind power, at all. Well, the same meteorological fact applies during cold weather. 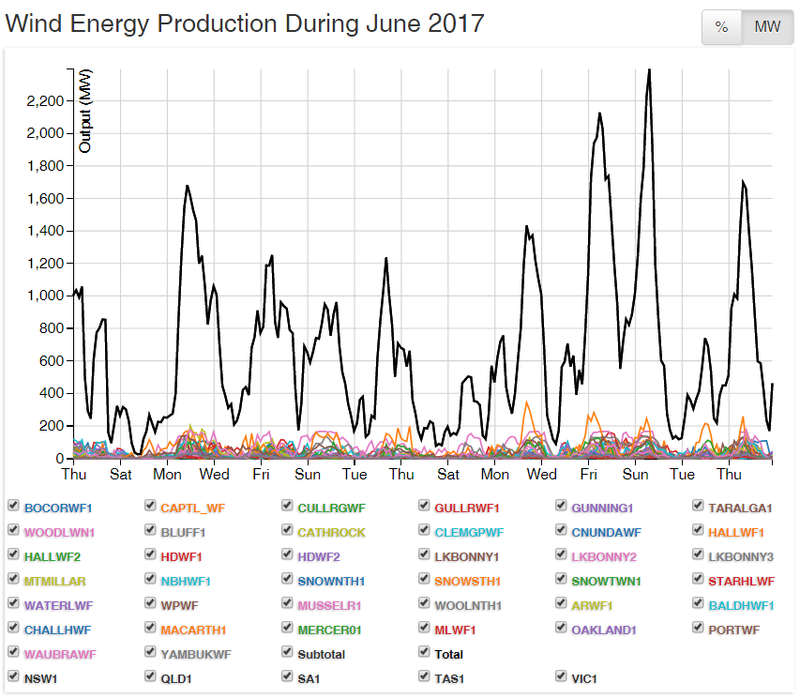 Set out below is the entire output from every wind turbine connected to the Eastern Grid, during June last year. The Australian Winter brings large, slow-moving high-pressure systems which sit across the South-East corner of the continent, resulting in cold, calm and frosty conditions. Still weather means those virtue signallers hoping to draw their power from Mother Nature are soon vexed and disappointed. But there’s no need to worry: in Australia there’s an old faithful coal-fired power plant chugging away somewhere in the system, keeping the lights on and preventing Granny from freezing to death; and the only casualties are the bruised egos of a few self-righteous, renewable energy zealots. Oh dear, how sad, never mind.